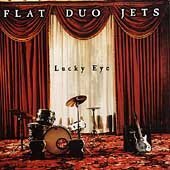 After fourteen years and numerous albums, tapes, singles, compilations ..., North Carolina's Flat Duo Jets have finally hit the majors. Lucky Eye is another raucus shot of everything that makes up the Flat Duo Jets' sound -> rockabilly, blues, 50's era rock, surf, jazz, country, swing, pop and everything in between, performed as only this duo knows how. Being on Outpost has given them the chance to flesh things out with more instruments and a fuller sound, but fans afraid of this being a "major label sellout" will be glad to know that Lucky Eye is more of the same old Flat Duo Jets they know and love.